Can anyone breakdown the cost of developing and implementing an upper stage nuclear thermal engine? After development, what could the price be of each engine produced? Any sensible answer to your question should make an implicit assumption on the number of engines to be ordered overall. That is, we need to know the number of planned manned flights to Mars and other important destinations, since fixed (sunk) costs of an NTR-based program are significant. The following ideas are based on a few NASA documents discussing NTRs. A stringent quality control program must be established bridging the efforts of NASA and DoE. There are a few concrete sums scattered across the NTRS, but I'd be wary of trusting them blindly. There are also many unknowns, from the number of firings required to the technology to manufacture fuel elements. 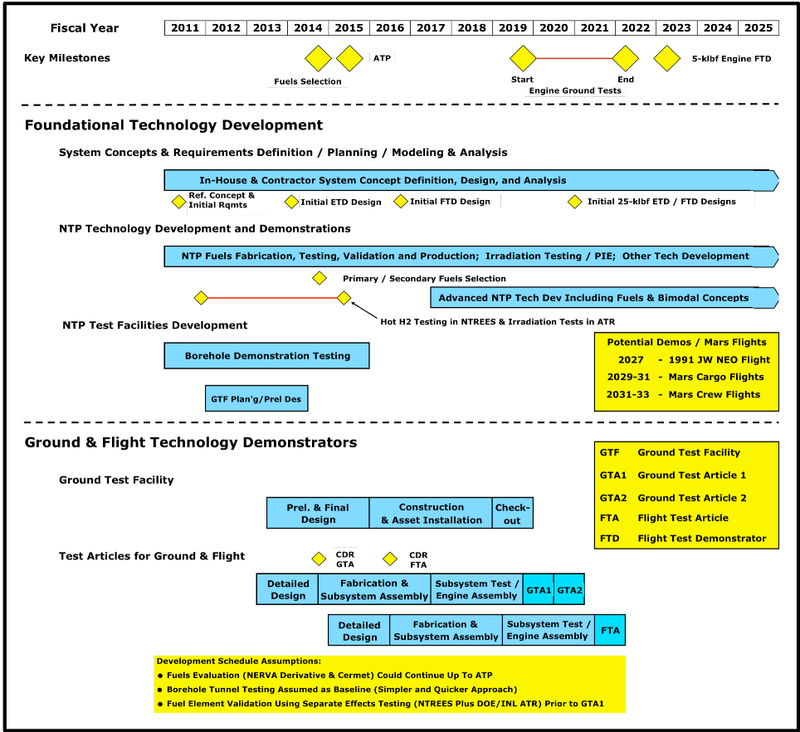 In the past 6 years NASA and the DOE have put a fair amount of effort into estimating the cost to recapture NTP technology assuming either graphite based or tungsten CERMET fuel. The estimates to include fuel development, reactor development, reactor testing and infrastructure ranged from $4 to 6 billion over 10 to 15 years. However, where there has been little thought thus far is in how many engines would be required per decade and how reusable each engine is. The lack of thought is partially due to the fact that the answers would be mission and architecture dependent and as of now there is no mission or architecture. During the Moon, Mars and beyond program (Constellation) there were some VERY preliminary studies that indicated a decade of lunar exploration could be 40 to 50% cheaper with NTP than chemical engines, but I am not sure at what point you made up the development cost. Not the answer you're looking for? Browse other questions tagged propulsion nuclear upper-stage ntr or ask your own question.